It’s probably only Icelanders who will get this without an explanation. In Denmark we have a large bicycle culture and is even in the top three over the most bicycle friendly countries in the world (Either number three or two depending on the list. Holland is always number one). I only know one person who doesn’t own a bike, and people will assume a person was neglected as a child if they can’t ride one (I don’t know a single person who can’t). Therefore the safety of cyclists is a high priority when making roads, and you will find bicycle paths everywhere that has a lot of traffic. The bicycle paths are often on the same level as the sidewalk, and in some places there is nothing to tell you where the sidewalk ends and the bicycle path start. That is not a problem for Danes because we grew up with it and knows where the invisible line goes. But Icelanders are not so lucky. Bicycles are fairly rare on the island, and bicycle paths almost non existent. So when they come to Denmark they think the bicycle paths are also for walking. In Denmark however it’s considered extremely rude to walk on the bicycles path, and if you don’t move when we ring our bell, then you’re just looking for a fight! Therefore a lot of Icelanders have stories of how they almost got ran over or yelled at by angry Danes on bikes. So it has become a bit of a joke that Danes on bikes target Icelanders when we see them. Denmark is teaching Norway to ride a bike here because even though Norway is also a very bicycle friendly country, they don’t have the same large bike culture because of all the mountains. 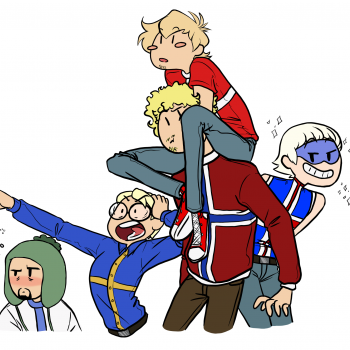 But I also just thought it would be cute for Denmark to try and teach Norway something for once. It seems that every country takes pleasure in scaring tourists. "It's probably only Icelanders that will get this without an explanation"
@SchrodySweden Australians think they have it bad, but they an entire continent to not run into each other. Denmark just has a bunch of islands! 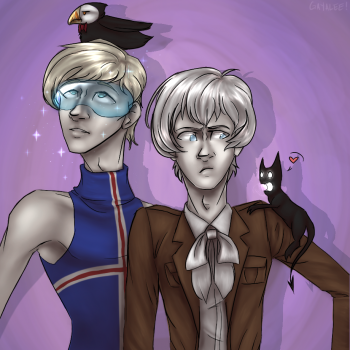 Iceland got so scared he lost his sparkles again.